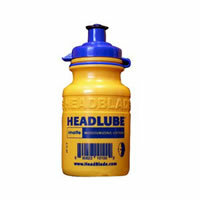 It took us a while to perfect HeadLube "Matte" as we know HeadBladers are a tough and demanding consumer. Like us (we're HeadBladers, too) they expect the best. So we deliver as promised. After hours of testing sheen, shine, and reflection using photographic equipment we created a great product that moisturizes your scalp without leaving behind a heavy shine. HeadLube "Matte" almost magically disappears leaving your head clean and feeling fresh without the use of dyes and perfumes. Enjoy!